What’s been going on this week – yet more sun? 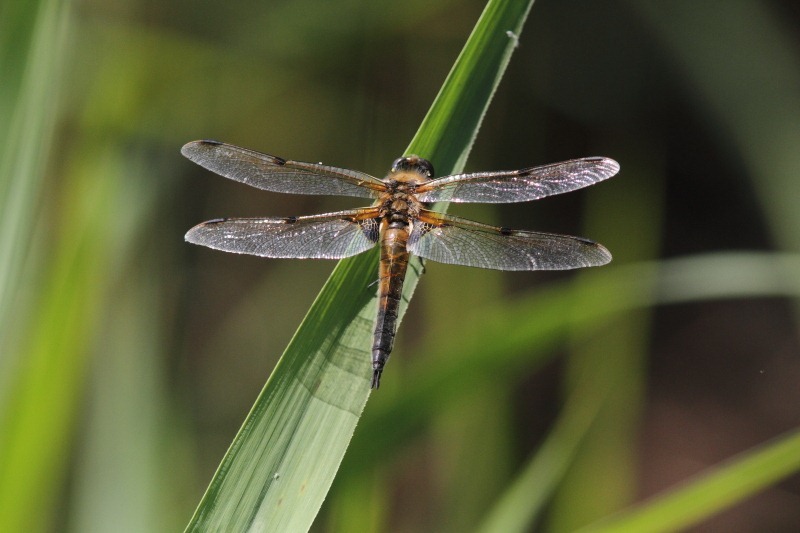 Having rejected Wicken Fen on Tuesday for fear of being surrounded by rugrats pond-dipping, Wednesday looked perfect to give it a try – sunny, hot and no organized events. I’d have to cough up the £6.30 to get in, not being a National Trust member (I don’t “do” old houses of the rich and/or famous), but it’s a nice place to walk and my main draw was their Variable Damselsflies (Coenagrion pulchellum). At least the car has an NT sticker (Carol does do impressive piles of the rich and/or famous) so at least I could avoid the £2 car park fee. I’d visited last year – must have been around the same time after returning from our French spring trip – and struck lucky finding one Variable that cooperated reasonably but I wanted a chance of some better shots. Besides, it’s a pleasant enough place for a walk. So, with my Navigation Officer doing good works for the Greensand Trust, Sally Satnav took me to Bedford, Cambridge, left up the A10 and right at Stretham to arrive at 11:00 AM. I parked, paid my £6.30 entrance fee whilst declining the staff’s encouragement to join the NT (see above) and also declining the option to shell out an additional £1.50 for a map (no wonder the NT is rich, cheeky devils), opting simply to follow the Nature Trail signs around the long route. Turning right up the boardwalk, I headed for a series of access points cut into the reeds along a small stream just beyond the historic, drainage wind pump; this is where I’d found last year’s Variable. There are four (I think) small open sections which were teaming with “bluets” (I dislike that term but …). I starting focussing to use my camera as a telescope, examining them more closely. 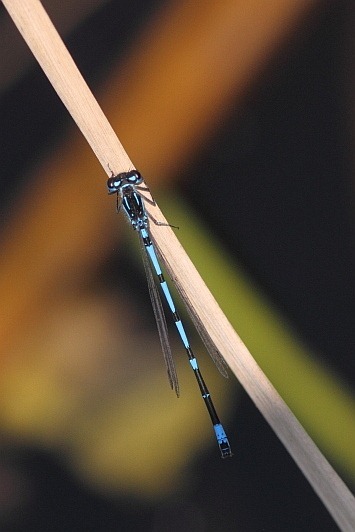 Everything I focussed on seemed to be an Azure Damselfly – very nice but not the reason I’d driven for 90 minutes. 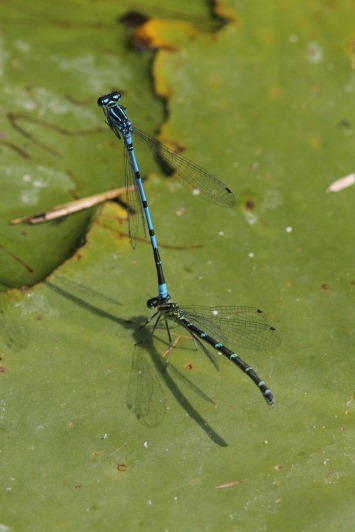 It’s hard work looking for something a bit different with dozens of blue-abdomened damsels flitting about, all attempting to mate in this year’s week of sunshine. Finally, having crossed to the opposite side of the stream to get on the right side of the sun, I spotted a tandem pair that looked just slightly different. If only I knew why they looked different. They settled on a lily pad and – bingo, tandem Variables! 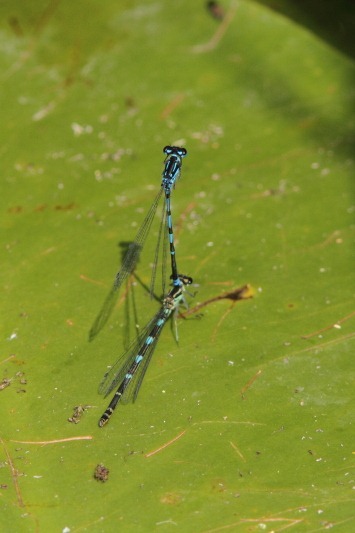 (The female looks v. difficult to distinguish without a male attached.) To illustrate the difficulty, here’s shots of both Azures (left) and Variables (right) in tandem on lily pads. After more patient focussing on yet more Azures, I eventually found this solo male posed reasonably on a stem. The NT had clearly had a lot of problems at Wicken Fen with rain and flooding; once off the boardwalk the circuit sported many sections of duck board to make the trail more readily passable and one section had to be closed with a by-pass cut through an adjacent field. Apparently, just a week ago, only the boardwalk was usable. Much of the waterside was inaccessible, being pretty overgrown by reeds. Large Red-eyes were out but the light on them was pants. My only other notable photo opportunity was this handsome Four-spotted Chaser who sat for me, vertically, thus fitting in to a narrow depth of field.